The PDP alleged that Buhari had voluntarily handed over his presidential candidacy to Great Ogboru,the gubernatorial candidate of the Party in Delta State. 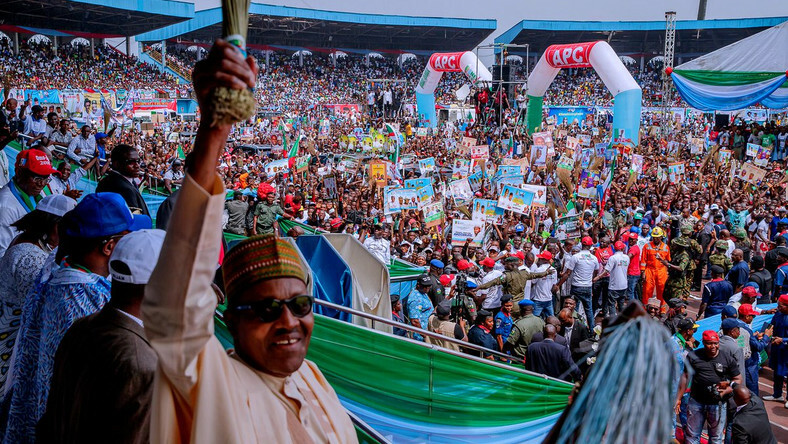 It stated that the perceived handover was at the APC presidential campaign rally. The PDP National Publicity Secretary, Kola Ologbodinyan, said the handover had shown that Buhari had foreseen his defeat and already switched into a handover mode. Ologbondiyan said, “The whole world watched as President Buhari, apparently overwhelmed by thoughts of his defeat, ended up declaring the APC governorship candidate in Delta State, Great Ogboru, as the presidential candidate. He added, “It is clear that President Buhari, worried by the shunning of his campaign by Nigerians, mistook the Warri Rally for the May 29, 2019 handing over ceremony that is four months ahead. Ologbondiyan alleged that Buhari had continued to display that he did not have the intention of seeking for a second term in office.